Find out everything you need to know on the new Alfa Romeo Giulia from independent vehicle review website Car And Driving. You can watch the video review to the left to see more of the car or read their written review below to get a true insight from an expert in the automotive industry. Alfa knows it must bring its A-game when it comes to engine technology in mainstream models, if it's to effectively take on German rivals. The engine line-up is built around a 2.2-litre diesel with 150bhp or 180bhp, along with a 2.0-litre petrol unit producing 200bhp and the twin-turbo 2.9-litre V6 used in the top Quadrifoglio super saloon variant, this latter unit putting out 510bhp. The Giulia gets a rear-wheel drive set-up, complete with classic 50:50 weight distribution and all models have to be ordered with auto transmission, an 8-speed unit. Pulling power is strong, whichver powerplant you select. Even the turbocharged petrol unit offers 330Nm of torque. The Giulia benefits from the careful management of weights and materials to obtain perfect 50/50 weight distribution across its axles, while four-arm Alfa Link rear suspension (with an Alfa Romeo-patented solution for toe adjustment) and a double-wishbone front set up should aid ride and handling. Also debuting on the Giulia is a clever semi-virtual steering axis set-up which optimises the filtering effect and guarantees rapid, accurate steering by keeping a constant caster trail in corners. Prices are predictably competitive with target Audi A4 and BMW 3 Series rivals, which means that buyers will be looking at paying in the usual £30,000 to £35,000 bracket for mainstream versions of cars of this type, though you can pay nearly £60,000 for a Giulia if you choose the top Quadrifoglio 2.9 V6 Bi-Turbo 510bhp variant. Equipment levels for more ordinary standard, 'Super', 'Tecnica', 'Speciale' and 'Veloce' variants will be strong, with a particular draw being the 8.8-inch Connect Nav 3D infotainment system that offers a sophisticated series of features and functions and is controlled by voice activation or manipulation of a Rotary Pad. The set-up is compatible with all mobile devices (Apple iOS and Android) and includes full control of Bluetooth calling and music streaming, as well as DAB digital radio and Hi-Fi digital audio. The navigation system includes high-resolution 3D maps with rapid route calculation even in locations where there it's not possible to find a GPS signal - this thanks to its advanced Dead Reckoning technology. It also facilitates TomTom map updates via USB and allows users to view more information regarding driving style and Alfa DNA settings. Safety kit runs to a Forward Collision Warning system and an 'Autonomous Emergency Brake with pedestrian protection' set-up, plus optional Adaptive Cruise Control, Lane Departure Warning and Blind-Spot Monitoring. Under the bonnet, every engine in the Alfa Giulia range looks decently efficient and pretty clean - which will of course be crucial if it's to attract company car drivers. The 2.2-litre JTDM-2 diesel with 180bhp is available in an ECO specification, which cuts emissions to less than 100g/km - despite this engine having 450Nm of torque. Even the 510bhp 2.9-litre BiTurbo petrol engine in the Quadrifoglio version claims to be best-in-class in terms of emissions, thanks to its electronically-controlled cylinder-disabling system. 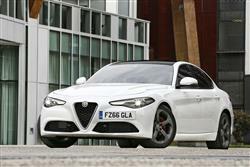 In other words, the days of Alfas being money pits for hopeless romantics are long past. As for peace of mind, well you get the usual three year unlimited mileage warranty covering parts, materials and labour, plus 3 years of AA Contact support which includes 24hr Roadside Assistance, Home Start, Relay, Relay Plus, European Cover, Accident Management, plus access to travel information, legal advice and technical information.